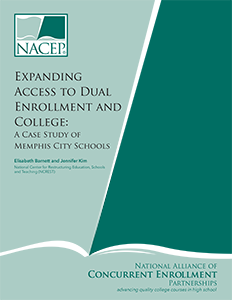 Written by Elisabeth Barnett and Jennifer Kim of the National Center for Restructuring Education, Schools and Teaching (NCREST), this case study examines a multi-year effort by Memphis City Schools to scale up access to dual and concurrent enrollment across many high schools with multiple college partners, while also serving large numbers of traditionally underserved students. Memphis is notable among large urban school districts for its sustained investment of resources to a district-wide dual enrollment initiative. Nationwide, urban students are less likely to have access to dual enrollment opportunities: while they represent 29% of all high school students, they account for only 24% of dually enrolled students (Thomas, et al., 2013). Over a four-year period, college course-taking by high school students in Memphis, including many in struggling schools, expanded by 45%, and the number of college partners increased from two to six. This case study research was undertaken to document how Memphis City Schools implemented the initiative and offer images of practice for those interested in developing similar programs to expand access to dual enrollment. The report was also written to share Memphis’ experience with local and state policy makers and other institutional leaders concerned with smoothing the pathway into college. Memphis’ dual enrollment program offers authentic college course experiences to high school students, the majority of whom are from groups traditionally underserved in higher education. Support from district leadership, including successive superintendents and deputy superintendents, played a vital role in making sure that the initiative was prioritized and adequately resourced. Dual enrollment programs contribute to the development of a college-going culture in Memphis high schools, including in those schools that are identified by the state as low-performing. While access to dual enrollment is often limited to students who earn high grades or scores on ACT tests, Memphis found ways to enroll a wider range of students. Memphis structured its program to maximize access to dual enrollment courses by forming and strengthening partnerships and establishing effective administrative structures. In researching the initiative we reviewed student enrollment data to understand changes in participation and demographics over time. We also visited Memphis in May 2012 to conduct semi-structured interviews with 24 administrators, instructors, and staff representing four high schools, two colleges, and the Memphis City School district office; we observed dual enrollment courses at three different high schools and spoke with students in those courses.